I am a mentor at present in Steve Blanks course at UCSF on lean startup methodology for healthcare startups. It’s fascinating to see the methodology being deployed simultaneously across a whole cohort of startups. I’ve been excited about the potential of crowdfunding for quite a while (here and here). 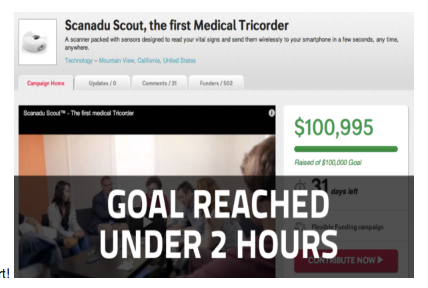 The campaign that launched this morning on Indiegogo by Scanadu (developing a Tricorder) is a good example of a campaign done right, and shows the potential of this approach. The campaign reached its goal of $100K in 2 hours. It’s up to $240K as I write this and day 1 is not ended. 1200+ people already pre-bought the product as a result of this campaign, thus doing a great job of validating that (some) people will buy it. Frankly, this is probably more important than the capital. Web-based healthtech startups have invention risk. Surprise! As readers of this blog know, I am interested in the potential of novel social networking and other internet-age techniques to transform our creaky healthcare system. A particularly intriguing class of startups is using these social techniques to change the behavior of patients in ways that lead to better health. For example, helping people to eat less, or avoid pre-diabetes, or manage their medication better, or avoid hospital readmission by taking better care of their heart disease. The exciting thing about these web-based startups is that they use Lean startup methodology, have low capital requirements, and are staffed with young, energetic, change-the-world types. 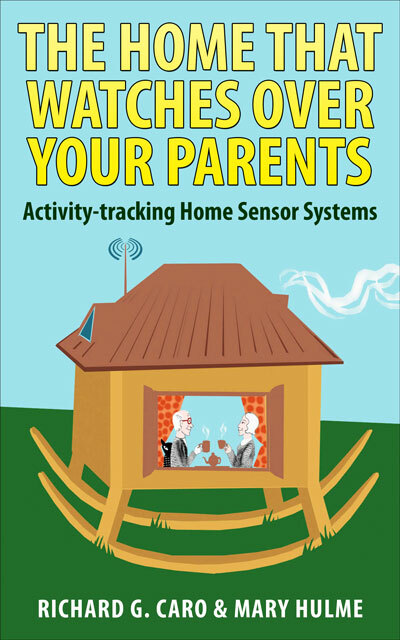 And, putting on my investor hat, they have market risk perhaps, but no invention risk, because all this internet stuff is engineering right? A hallmark of new ventures that are based on scientific advances in fields like medical devices, health tech, or cleantech is that they often have invention risk. Frequently they also have market risk. And while the standard venture capital reaction to startups with both market and invention risk is “come back when one of the risks has been eliminated”, I find them exciting, have been involved with quite a few of them over the years, and am always looking for ways to optimize the rate of risk reduction per dollar invested. For the last 18 months I have been trying to apply / modify the principles of lean startup and customer development to a handful of companies I have been helping, each of which has a healthy amount of invention risk as well as a dollop of market risk. I have gained some insights that I have not seen discussed elsewhere, and thought I would share them. The Lean Startup movement is a good example of the new internet-company methodologies mentioned in my last post. I got around to reading Eric Ries’ book over Thanksgiving. I liked it a lot, and I have been mulling over what its lessons are for non-internet businesses – particularly for the sort of science-based business I am interested in (medical devices, cleantech, telecom infrastructure). Does “Lean” need tweaking for science-based startups? The number of available early adopters, and ease/cost of access. Speed of each iteration cycle.